The Oregon Zoo (formerly the Washington Park Zoo), is home to hundreds of animals in a myriad of habitats. One of the more popular is the otter habitat (Eddy the Otter is a minor youtube celebrity with over 1.5 million views) and like any well used space, the otter habitat needs occasional upkeep and maintenance. Oregon Metro, which is the elected regional government for the Portland Metropolitan area, is “responsible for managing Portland region’s solid waste system, coordinating the growth of the cities in the region, managing a regional parks and natural areas system, and overseeing the Oregon Zoo, Oregon Convention Center, Portland’s Centers for the Arts, and the Portland Expo Center” (wikipedia). 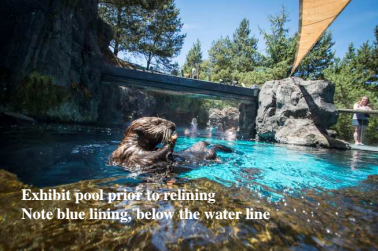 Metro put out a public bid asking for the removal and replacement of coatings on the pools and pool decks in the sea otter and sea lion exhibits at the zoo. Long Painting’s Vancouver/Portland office was awarded the project. Zoo animal care experts requested a custom brown color to protect the otter’s eyes from the sun and create a more natural habitat setting, and a smooth surface to make cleaning easier. For this, Long Painting crews utilized Endura-Flex 1988 for the final coat, Endura-Flex 1200P 100% solids epoxy, and Endura-Flex 1200F filler to fill holes and rock pockets. Working from July 1, 2015 to August 31st 2015, crews used an ultra high pressure water jetting machine, the AquaMiser Ultra Boss D115, for the removal of the existing coatings. The machine is capable of pressures up to 40,000 psi! The work was also done during business hours and the pressure washing equipment was particularly loud. Long Painting crews set up a sound management system consisting of sound dampening blankets which were set up around the entire Sea Lion and Sea Otter exhibit. At any given time, zoo visitors could be within 15 feet of the work area. As usual, the job was done on time and on budget.